Who Voiced Woody in the 'Toy Story of Terror' SKY Broadband Commercial? Have you ever been watching your favorite Toy Story character during a commercial or in a video game and said, "hey, that doesn't completely sound like Woody from the movie"? Well, you're not alone. A reader of ours, Emmet, recently inspired us to write this post after he watched the most recent Toy Story of Terror! SKY Broadband advertisement and asked, "Was that really Tom Hanks' voice? It didn't sound like it!". Emmet was right to question the accuracy of Woody's voice because this is not Tom Hanks' vocal work in the commercial. You may be surprised to find out who provided the voice though - it's Tom Hanks' Brother, Jim Hanks. Yup, Jim has been filling Woody's vocal chords for a lot more than you may think over the years - everything from commercials to video games. Jim even voiced Woody in the upcoming release of the Toy Story in Space play set for Disney Infinity video game (Woody character to be released October 1, play set to be released October 22). 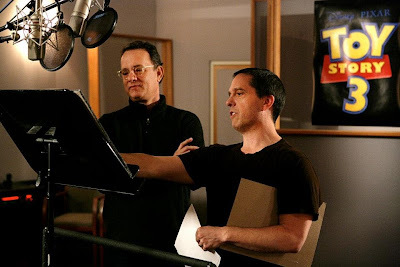 Check out this hilarious video as Tom Hanks describes working with Pixar and how Jim was asked to voice Woody's smaller roles. You may be wondering who will voice Woody in the full 30-minute Toy Story of Terror! feature. Well, wonder-no-longer - Tom Hanks will be back at the helm for his signature cowboy role. Vocal changes are quite common between feature films and smaller work as many actors are substituted for various reasons. For instance, the television series, Buzz Lightyear of Star Command, found Patrick Warburton voicing Buzz Lightyear instead of the more familiar, Tim Allen (although Tim did voice Buzz for the direct-to-video feature of the same name ). Pixar Post: Who Voiced Woody in the 'Toy Story of Terror' SKY Broadband Commercial?